Think that's just a basket of tomatoes? Not so. That, right there, is actually, oh, about fifty very good reasons to live where I live. You don't think home-grown, vine-ripened, grown in the hot sun 'til perfectly sweetened tomatoes are a compelling enough reason to base your decision on where to make your home? I do. 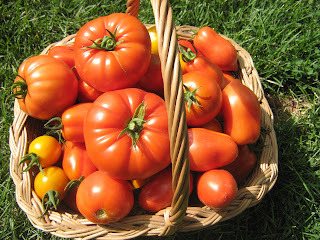 And I think if you could taste these tomatoes you might very well agree with me. Here is one (just one) of our many favourite ways to eat them. 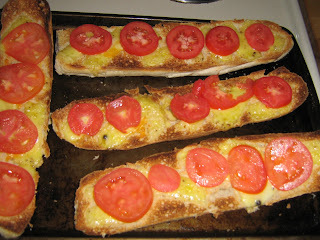 Toasted tomato and cheese buns, made with a sprinkle of Jerseyland Organics peppercorn Gouda. Yum. I totally agree with you, Heather. I'm so thankful to live where so many wonderful fruits and veggies grow so abundantly. It's bliss!